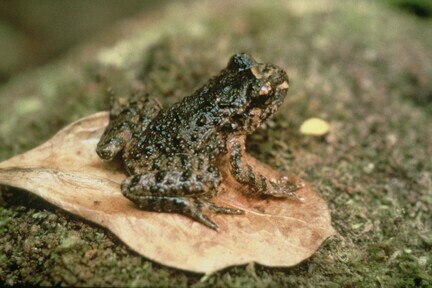 New Zealand is home to four varieties of frog, most of whom are earless, voiceless, and exist in damp habitats, however there is one such species that enjoys watery climes: the miniscule Hochstetter’s frog, which is listed as vulnerable on the ICUN’s red list. So when I heard that a large slip had occurred at Te Puke Stone Enterprises my heart sank. The question that kept reappearing in my mind was did the slip enter the Rarapahoe stream, the last known haven of the genetically distinct Oropi Forest Hochsetters frog? Although this speckled little frog hasn’t received the media attention of our Archey’s frog, who’s just on the brink of doing a vanishing act, the Hochstetter’s frog is suffering from similar threats such as diseases such as amphibian chytrid fungus , predation from cats, rats, hedgehogs & possum and habitat destruction. My initial investigations tentatively confirmed my worst fears – the monitoring officer from Environment Bay of Plenty said it was very likely that sediment had flowed into the stream during the storm event that had triggered the slip. I decided to go for a walk up to the site on Sunday and have a look. After a one kilometre trek into the site, I could already see the slip looming in the distance, shortly after I was confronted by the quarry owner, who told me that I was trespassing and ordered me to leave. I knew I was on public conservation land so keep going. When I arrived at the slip my worse fears were confirmed. The slip had started just below one of the quarry roads, and sure enough, it was silting up the stream below. For years now, the Te Puke & Tauranga communities have been concerned about this stone quarry and its effect on this vulnerable population of frogs. Its agreement with DOC to protect these treasured amphibians, however the rules placed on the quarry have largely been flouted. Indeed, both DOC and Forest and Bird have documented historic and recent destruction of stream buffer zones (designed to protect the frogs) and inappropriate earthworks and storm water / sediment controls. Dismayed, I headed back to my car only to be approached by the quarry operator again, who told me that he had phoned the police. He then threatened to let down my tyres. Walking on, I returned to my car to discover that yes, my tyre had been popped. This was turning into a real Chinatown story…. Shortly after the police arrived, and after going to court, the quarry officer has been charged with ‘unauthorised tampering of a vehicle’. The police did not pursue his trespassing charge. Currently the quarry owner’s authority to access and operate has been revoked by DOC on the basis of his breaches of the authority conditions (see above). Forest & Bird are pursuing appropriate restoration of the destroyed buffer zones and improvements to the earthworks and stormwater / sediment control. We are also exploring whether the quarry owner has committed breaches of the Wildlife Act. Frogs are cool so visit www.nzfrogs to learn more about these unique taonga and how you can help. Great work. Al, in bringing this case into the public eye and keeping the focus on DOC and EBOP to protect the frogs and monitor the habitat. September 27th to October 3rd 2009 is Frog week. There are many organizations who are involved in the study and protection of New Zealand’s native frogs. This story could be could be revisited again then to see progress and to highlight the plight of this rare frog. Well done Al. I believe there were Hochstetter’s frogs deep in the bush on my parents property near Waipu, when i was a child. I never saw them and i hope they are still there. At one stage there was a plan for SH1 to go through their habitat to bypass the Brynderwyn hills. FYI – link to nzfrogs at the end of the article is broken, I think you need .org in there as well. Well done Mr Fleming. unreasonable drop-kick, bullies like this quarry operator need to be confronted when it comes to protecting endangered wildlife, particularly when they have no legal footing.